The Dodgers led off the 2014 MLB season with a 3-1 victory over the D-Backs on Opening Day in Sydney, Australia. Clayton Kershaw gave the Dodgers the quality performance that’s become routine when he takes the hill, striking out seven in 6.2 innings while only allowing one run on five hits and a walk. The run given up by Kershaw was his first allowed in 25 Opening Day innings, and his Opening Day ERA is now 0.35. As for the offense, it started with Adrian Gonzalez, who wanted to walk more in 2014, and he led off the top of the second with a four-pitch walk. 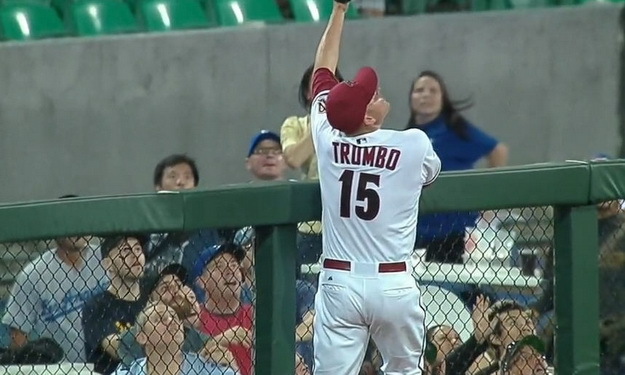 Then things got weird, as Mark Trumbo Trumbo’ed a Scott Van Slyke fly ball to left in glorious/hilarious fashion. Yeah, buddy. Can’t wait for those measurements on Field F/X … cause wow. Andre Ethier then cashed in A-Gon with the first RBI of the MLB season on a grounder to second, putting the Dodgers up 1-0. To extend the lead, Van Slyke hit the first homer of the 2014 season after A-Gon reached on a strikeout wild pitch. That accounted for the last of the team’s three runs. After Kershaw exited, the bullpen shut the game down. Chris Perez entered after Kershaw’s 102 pitches and got the final out of the seventh. Brian Wilson followed with an inning of scoreless work, striking out two. Kenley Jansen walked a man but had a strike out and managed to finish the game off without any real danger. Also he threw this pitch, which is just stupid. That 1-2-3 punch could be lethal all year if the trio is right. –Yasiel Puig and Juan Uribe combined to go 0-for-9 with five strikeouts, which means they should be benched. –Hanley Ramirez went 0-for-4 and looked a bit shaky in the field, accounting for at least one of Kershaw’s “hits” allowed. 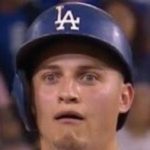 -Alex Guerrero made his MLB debut by entering the game to face Oliver Perez … and then immediately exited for Mike Baxter after the D-Backs brought in J.J. Putz.